Imagine this: You wake up from cryostasis sometime in the far future to find yourself in a chilling - literally chilling, as in frozen - post-apocalyptic world. Everything is frozen solid, you are completely naked, and the only other intact cryogenic tube contains ... a bicycle? Or wait, what was that? Maybe you're not alone after all! Best hop on your bicycle and follow the trail of frozen soap bubbles in search of companionship. Quickly now, quickly! 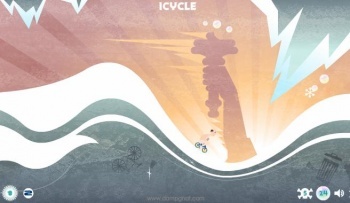 Icycle is, at its heart, a traditional platformer through and through. You must cycle and jump your way through the frozen wastelands, avoiding pitfalls and spikes, while collecting frozen bubbles. Here's the catch, though - there's no reverse; you can only move forward or brake. In the apocalypse, there's no going back. While the game starts off relatively simple, I'm not going to lie - this thing gets tough in later levels. There will be moments where you will make it through a challenging section only to stare slack-jawed at your screen as the game yanks the rug out from under you. This game is a jerk. But there's just something about the whole aesthetic - and wanting to find out if you are alone - that keeps me wanting to play on. Friday time-waster indeed.